Because Boston is buried under several feet of snow for the third or fourth time in a few weeks, Boston University was once again on a snow day today. But, I knew I had to get stuff done. I'm behind on a lot of things that need to get done. So, despite the roads being in tough shape, brave soul that I am, I made it over to the Catholic Center. When I got there, not surprisingly, our parking spots were somewhat obstructed. (Our spots are under the pile of snow you see in the picture). I found a place to park (illegally), went inside the Catholic Center, and got right to work. Well actually, I texted a student and we went out for lunch. At lunch, this student and I talked about Lent, fasting, prayer, friendship, the Church, and a bunch of other stuff. It was great just to hang out and talk about good stuff. But, as soon as I got back to the Catholic Center, I got right to work on all of the stuff that I really need to get done. Well actually, by now our intern had arrived into work, so we hung out for a while. We talked about life, Lent, prayer, Catholic Center stuff, and we decided that we should really shovel out our two parking spots. 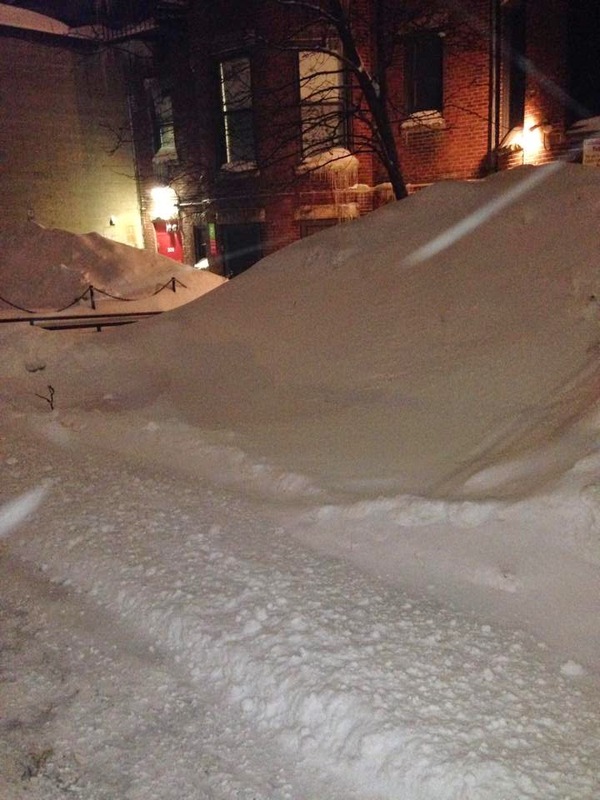 So, we posted a Facebook appeal to help shovel. We and three students spent an hour or so clearing out a ton of snow. It was a good time. As soon as I got inside after shoveling, I immediately got to work . . . well, actually, we hung out a little bit more with a few students and then we had a quick liturgical committee meeting. Then it was time for Mass. Around 20 students showed up for Mass. After Mass, we had a low key discussion on how to have a good Lent. I spoke for about 20 minutes offering some thoughts and then we broke up into small groups, discussed our plans for Lent and past experiences of Lent. After that, I hung out for a while with some students and a couple of Jesuit seminarians who help us out, and I came home. I never got anything done that I had set out to do. Now, eventually it will have to get done. But, among the things that I love about being a priest is the time I spend not getting stuff done. I'm glad that there are people who get stuff done in this world. If it weren't for them, I wouldn't survive. But, I'm grateful that my life is spent wasting time by being close with people, talking about beautiful things, building up the communion of the Church through the sacraments, preaching, friendship, shoveling, having lunch, and hanging out. Punctuating all of these other events today, were several requests for Confession. And there's nothing better than that. I am grateful to God for the grace of accomplishing nothing of what I set out to do today. It was a big, grace-filled day of wasting time with some extraordinary young people, witnessing their deep faith and charity, and growing together in Christ. What a wonderful waste of time! The students at BU are so fortunate to have a spiritual leader who is led by the Spirit and not the world! I will be praying for you and the success of your ministry! God Bless! Thank you for being there for the young people who are attempting to keep their faith while in college. There are so many who lose or leave the their faith. A good and faithful priest to guide them makes such a difference. Praying an Ave for you. Fasting, Prayer, and What's the Other Thing? Why Pray When Things Are Dark?